November 18th, the realease of the testing version of CSSU was released. 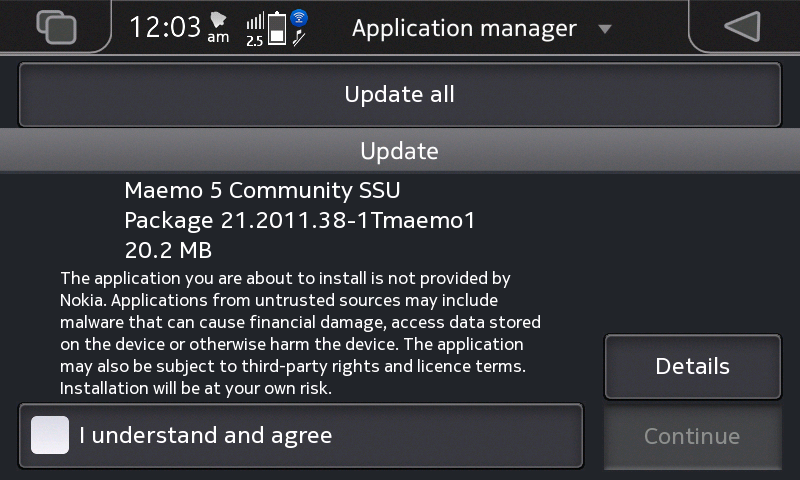 yesterday marks the release of N900’s new stable CSSU firmware update. 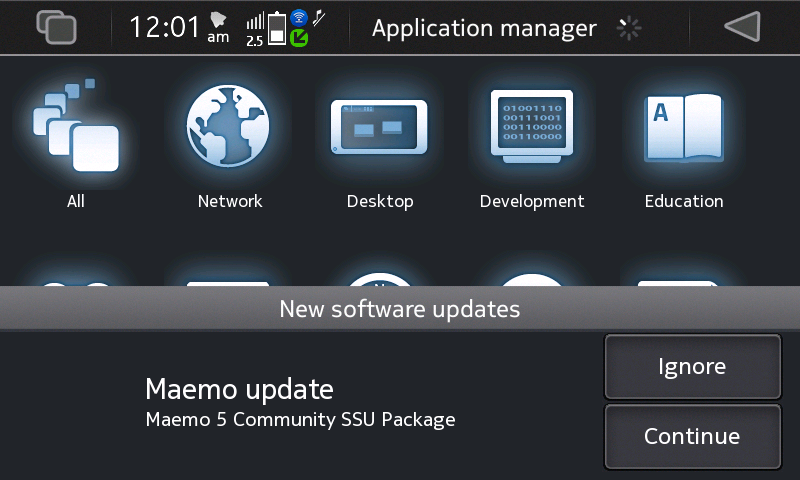 v21.2011.38-1Smaemo1 . 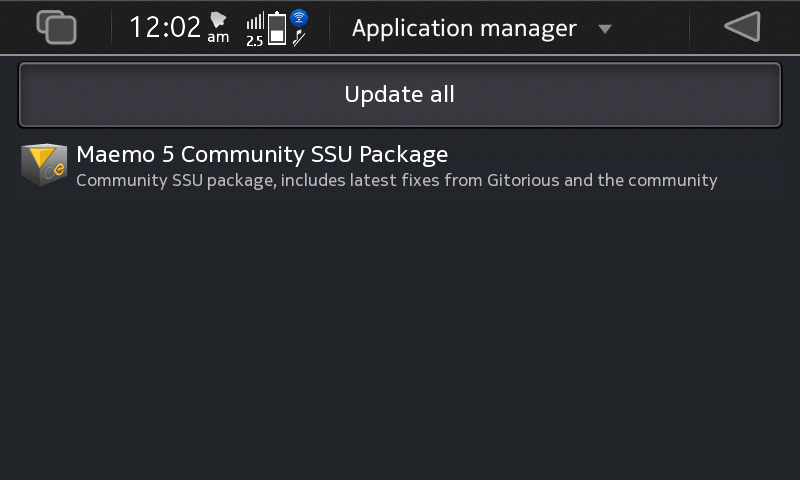 Finally a stable CSSU for all USERS. and choose the STABLE version via your N900. Fixed double-ui corrupting videos after switching to the background while recording. Fixed double-ui overwriting user data. Fixed portrait wallpapers in the Hildon-home. CSSU PR1.3.1 rebased on top of official release. Arguably the best facebook client on Symbian platform & Meego + Maemo has made it to the Nokia Store for download. You have the option to try the app for a week period, or buy it if you think its a must have for your daily social needs. Breaking News : CSSU update for the n900 ! The 20.2MB Update sure feels like a huge changelog is expected to come after update. Fixed camera-ui corrupting videos after switching to background while recording. Fixed camera-ui overwriting user data. Fixed portrait wallpapers in hildon-home. CSSU rebased on top of official PR1.3.1 release. This is the first release that will hopefully be followed by a stable release, the T in the version string stands for testing. The settings applet (About CSSU) in control panel now shows what flavor you have installed. Keep in mind that changing between either flavors requires a reflash, but more about that later when the stable version’s out. Show flavor in dialog, added more names. Depend on the pr 1.3.1 packages. Swype makes texting easy with its unique functionality. Largely available on Nokia Symbian devices for a year or so. Now it has made its debut appearance on the Meego Harmattan platform device the N9. It comes with the Latest Update released on the N9 this week. Swype software comes from the maker of the widely used T9 input methord on almost every mobile phone with physical keys. More UI and feature related information on the video after the break. Here is a video of the Nokia N9 running Meego 1.2 Harmattan OS also known as Maemo6 . 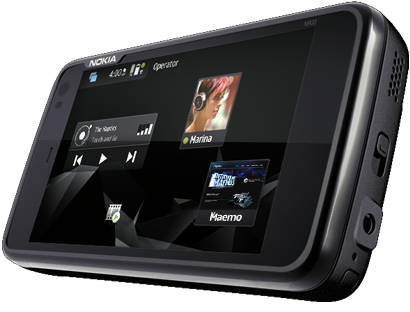 The N9 is said to be the successor of the legendary Nokia N900. And as nokia claims, the N9 is doing a good job of keeping N900’s reputation of robust multitasking. Wicked looks and World’s first SWIPE UI. Note : n900 is the first phone with multiple desktops, which you see on almost all devices these days. The video tour after the break. Nokia’s biggest event ever was earlier this week when they announced their first accomplished windows mobile phone in london. With the release of Nokia Asha Family and a cool prototype that could change the way we navigate with mobile devices, nokia has successfully ended its mega event . Here are the keynote highlights of the Nokia World Event 2011.
from today im going to blog straight from my nokia device on the go. so watch for my exciting mobileblogs here in MgB!